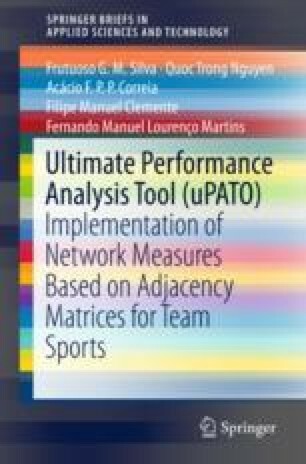 This chapter presents an overview of uPATO application, which was designed mainly for network analysis applied to team sports. However, this tool can be used for any network that can be represented by an adjacency matrix (e.g., a computer network, a telecommunication network, or even a social network, etc.). Thus, a first module was developed to allow codify the network, which, in the case of team sports, is given by a matrix with the sequences of interactions between teammates (i.e., a digraph). But this tool was designed to support graphs and digraphs, weighted and unweighted. Team sports are a good example of the necessity for calculating metrics on weighted networks. uPATO was developed with the main objective of analyzing team sports, where weights represent the frequency of the interactions between players, providing fundamental information on the analysis of the team factor. It calculates metrics in both weighted and unweighted networks and separates metrics into three major categories: individual metrics, subgroup metrics, and team metrics. Beyond metrics that uPATO allows calculating, a representation module that allows visualizing the network was also developed (i.e., the digraph or graph, weighted or not) and some charts for the data were calculated. Besides, the uPATO tool has an additional module for processing geolocation data. Currently, some teams use GPS devices to have the position of the players during the match (e.g., FieldWiz and TraXports formats are supported). Thus, uPATO has a set of metrics based on geolocation data of the players. This new functionality extends the uPATO capacities for team sports analysis but also for other activities where GPS data is available. But, it does not consider yet the possibility of the ball with a GPS device. However, this additional module is out of the scope of this book but the metrics implemented are described in a previous publication .